Big Data : Advanced Computing Architectures and Large Scale Computing: Big Data : Watson - Era of cognitive computing !!! Innovations in Exascale computing could imitate the human brain . But won't replace !. It is believed that artificial intelligence would take long time to function like human brains .But not sure how long we need to wait for this revolution.No doubt ..Computers have brought a revolution in human life. Nowadays computers are busy taking most of the human activities , can think and has problem-solving capabilities. These factors make us believe that computers are likely to replace human beings in future. IBM announced a major new initiative aimed at accelerating progress in the era of cognitive computing.Big Blue is using the human brain as a template for breakthrough designs. Assume yourself as a supercomputer that's cooled and powered by electronic blood,natural healing system,thousands of I/O activities :) . In the era of real-time Big Data, the “old number crunching” computers are not sufficient anymore and new computers are required that can interact with us, the way we want to interact with each other. That can visualize data the way we humans interact with the world.Although the computers to date are capable of handling vast amounts of data, they still do that with separated memory and processing and doing all the steps in a sequential order. IBM is developing a new type of computers, cognitive computers that can be trained with artificial intelligence and machine-learning algorithms to become more like humans and deal with data the way humans do.Cognitive computing will bring a level of fluidity and appropriateness to the way we will interact with computers. The idea of the new cognitive computer that IBM is developing is to facilitate human cognition beyond the current barriers because of the ever-increasing volumes of data. His name is Watson. He's bad with puns. Great at math. And, he won the game show "Jeopardy!" against real, live, breathing, thinking humans (Brad Rutter and Ken Jennings, two of Jeopardy's champions) .The top prize for the Watson showdown is $1 million, with $300,000 for second place and $200,000 for third. Jennings and Rutter planed to donate half their winnings to charity. Watson won $1 million and all of its winnings donated to charity...Link where the humans were destroyed by Watson @ final round of man vs. machine.Those game shows were reminiscent of IBM's "Deep Blue," a chess-playing computer that, in 1996 and 1997, was pitted against world champion Gary Kasparov.Kasparov beat the first version of Deep Blue in 1996, but was defeated by a revamped program in 1997 -- with Blue scoring two wins and three draws in a best-of-five contest. Deep Blue relied heavily on mathematical calculations, while Watson has to interpret human language, a far more difficult task. IBM’s computer system Watson vanquished human contests on the TV quiz show Jeopardy!. 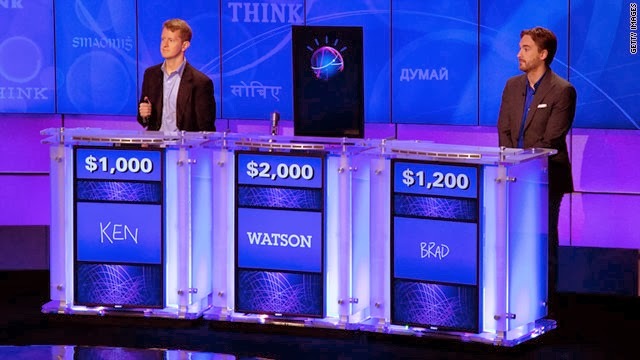 Its combination of machine-learning strategies and an ability to process natural language—or ordinary speech—allowed it to defeat human contestants .Watson's software is powered by an IBM Power7 server (supercomputer with 2,880 IBM Power750 cores, or computing brains, and 15 terabytes of memory) and, according to developers, is optimized to process complex questions and render answers quickly. The question now: can it defeat the complexities of the real world? IBM is confident and it will also combine Watson with other “cognitive computing” technologies and invest a further $1 billion into a business it says will define the future of how companies use data. IBM Watson Group, to be headquartered in New York City’s Silicon Alley. The organization is unique within IBM– integrating research, software, systems design, services and industry expertise. This will revolutionize everything from cancer care to call centers. Among IBM’s biggest plans for Watson has been creating a system that can read medical records and recommend treatments, particularly for cancer patients.Watson is still a medical student or about to complete the internship :). Watson is going to work with doctors, helping oncologists treat patients. Only 20 percent of the knowledge physicians use to make diagnosis and treatment decisions today is evidence based. The result? One in five diagnoses are incorrect or incomplete and nearly 1.5 million medication errors are made in the US every year. Given the growing complexity of medical decision making, how can health care providers address these problems?. The information medical professionals need to support improved decision making is available. Medical journals publish new treatments and discoveries every day. Patient histories give clues. Vast amounts of electronic medical record data provide deep wells of knowledge. Some would argue that in this information is the insight needed to avoid every improper diagnosis or erroneous treatment. In fact, the amount of medical information available is doubling every five years and much of this data is unstructured - often in natural language. And physicians simply don't have time to read every journal that can help them keep up to date with the latest advances - 81 percent report that they spend five hours per month or less reading journals. Computers should be able to help, but the limitations of current systems have prevented real advances. Natural language is complex. It is often implicit: the exact meaning is not completely and exactly stated. In human language, meaning is highly dependent on what has been said before, the topic itself, and how it is being discussed: factually, figuratively or fictionally - or a combination. What Watson can do—given the right data—is pull up relevant literature and also consistently recommend the same course of treatment that’s suggested in the written medical guidelines that doctors consult. But following guidelines is also something that less sophisticated software can do. Watson can easily duplicate a guideline recommendation. Machine that docs can turn to as an adviser and colleague.That system will be able to make recommendations for treating several cancers based on manually organized inputs—structured data—and will also interpret text notes for two cancers, lung and breast, with reasonable accuracy. This is the right time to move forward with a bigger investment. How Watson can address healthcare challenges ? Watson then mines the patient data to find relevant facts about family history, current medications and other existing conditions. It combines this information with current findings from tests and instruments and then examines all available data sources to form hypotheses and test them. Watson can incorporate treatment guidelines, electronic medical record data, doctor's and nurse's notes, research, clinical studies, journal articles, and patient information into the data available for analysis. Watson will then provide a list of potential diagnoses along with a score that indicates the level of confidence for each hypothesis. The ability to take context into account during the hypothesis generation and scoring phases of the processing pipeline allows Watson to address these complex problems, helping the doctor — and patient — make more informed and accurate decisions. The University of Texas MD Anderson Cancer Center in Houston ranks as one of the world's most respected centers focused on cancer patient care, research, education and prevention.MD Anderson’s Moon Shots Program is an unprecedented and highly concentrated assault against cancer. IBM’s Watson technology is expected to play a key role within APOLLO, a technology driven “adaptive learning environment” that MD Anderson is developing as part of its Moon Shots program. APOLLO enables iterative and continued learning between clinical care and research by creating an environment that streamlines and standardizes the longitudinal collection, ingestion and integration of patient’s medical and clinical history, laboratory data as well as research data into MD Anderson’s centralized patient data warehouse. Once aggregated, this complex data is linked and made available for deep analyses by advanced analytics to extract novel insights that can lead to improved effectiveness of care and better patient outcomes. One of the richest sources of valuable clinical insight trapped within this patient data is the unstructured medical and research notes, and test results, for each cancer patient Watson’s cognitive capability has been shown to be powerful tool to extract valuable insight from such complex data and MD Anderson's Oncology Expert Advisor capability can generate a more comprehensive profile of each cancer patient. This will help physicians better understand the patient’s data in the evaluation of a patient’s condition. By identifying and weighing data-driven connections between the attributes in a patient’s profile and the knowledge corpus of published medical literature, guidelines in Watson, MD Anderson’s Oncology Expert Advisor can provide evidence-based treatment and management options that are personalized to that patient, to aid the physician’s treatment and care decisions. These options can include not only standard approved therapies, but also appropriate investigational protocols. Finally , Why did they name it Watson? It's the name of the founder of IBM, Thomas J. Watson. Those possibilities that Watson's breakthrough computing capabilities hold for building a smarter planet and helping people in their business tasks and personal lives - stunned everyone !!! Click here : Overview of apache Hadoop . Click here: Big Data Revolution and Vision ........!! !